Purplestem Angelica. Angelica atropurpurea L.
American angelica, great angelica, high angelica, purple angelica, masterwort. Purplestem angelica is a native herb, common in swamps and damp places from Newfoundland to Delaware and west to Minnesota. This strong-scented, tall, stout perennial reaches a height of from 4 to 6 feet. It has a smooth, dark purple, hollow stem 1 to 2 inches in diameter. 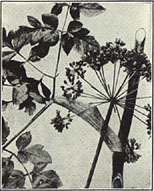 The leaves are divided into three parts, each of which is again divided, with many broad leaflets. The lower leaves are sometimes 2 feet in width, but the upper ones are smaller, and all have very broad stalks. From June to July the greenish-white flowers are produced in somewhat roundish heads, which sometimes are 8 to 10 inches in diameter. The root is branched, from 3 to 6 inches long, and less than an inch in diameter. It has an aromatic odor, and the taste at first is sweetish and spicy, afterwards bitter. The fresh root is said to be poisonous. The root, dug in autumn. It must be carefully dried and preserved, because it is very subject to the attacks of insects. prev: Prickly Lettuce. Lactuca scariola L.
next: Purple Trillium. Trillium erectum L.